The last article I posted was my 1000th since I launched this blog in 2005. I've tracked traffic each month along with page views. Blogger started tracking stats in July 2009 and I've recorded 66,000 page views since then. I occasionally meet people who have been getting my email and following my blog when I'm at conferences. A few email me to say "thanks" for what I do. I'd like to hear from more and I hope that these ideas are leading to stronger programs in more places because of the role some people are taking as intermediaries who are trying to help fill neighborhoods throughout a region with great programs. I'm not sure what the advertising value is for the type of traffic I get. However if you'd like to advertise or be a sponsor, it can help us continue to do this work. This article on the RSA blog explores the role of universities in supporting social innovation. Since I've written often about the role universities could take, I hpe you'll read this and help me connect strategically with universities in the US and abroad. I just read this Made in the World article in the New York Times, written by THOMAS L. FRIEDMAN. I found about it through a post made in one of the Facebook groups that I follow. 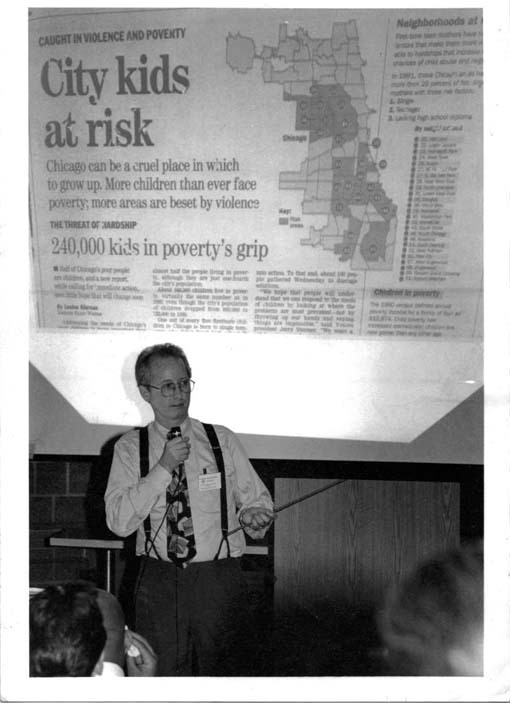 I'm a small organization operating in Chicago since 1993. I focus on aggregating and sharing ideas and information that anyone can use to help kids in poor neighborhoods move through school with the help of mentors and structured non-school programs. My first exposure to e-learning was by following groups in Australia when I first went on-line in 1998. I use a web based map/directory to show where programs are needed. My first program locator was built in 2004 by a grad student from India. The Interactive Program locator was built by a team in India with a project manager in Baltimore. Interns from Korea, China and India have been creating visualizations so more people understand our ideas...and they communicate some in their own language so the ideas are available in their own countries. As long as we can imagine new solutions to old problems the possibilities of finding talent to help build these solutions are unlimited. What we need now are some sponsors and benefactors who will boost our ability to participate in this global marketplace of ideas and innovation. You can advertise with us or you can take a much greater role and help us build and sustain this social problem solving platform. I was in Washington, DC on Jan 24 and 25 for the 2nd Annual National Mentoring Summit. More than 400 people involved in mentoring programs, networks and support organizations were connected for two days of networking and workshops. Now the real work of putting these ideas into practice takes place. One of the emotional highlights of the Summit came yesterday during lunch when Beverly Bond, Founder of Black Girls Rock! moderated a panel of students/volunteers who each told of how mentoring made a difference in their own lives. As I listened to Beverly and this panel it reminded me of the year-end dinner celebration we held each year since 1973 to celebrate the connection of youth and volunteers in the programs I've led in the Cabrini Green neighborhood of Chicago. The panel members were different people from different programs, but the messages were the same. As Beverly said, "people in these programs know the many small and big success of tutor/mentor programs." Data and professional evaluation statistics don't paint the real picture. Below is one of many videos created at Cabrini Connections during the past 15 years. You can find more here and here. The video below shows parents speaking at one year-end dinner. These stories are powerful. They need to be told over and over with the same reach and frequency as corporate ads for fast food, banks, and wellness. But we don't have the money. Thus we need volunteers from business, colleges, high schools and faith groups to become our journalists, movie makers and story tellers. This is another video created by a volunteer and telling our story. 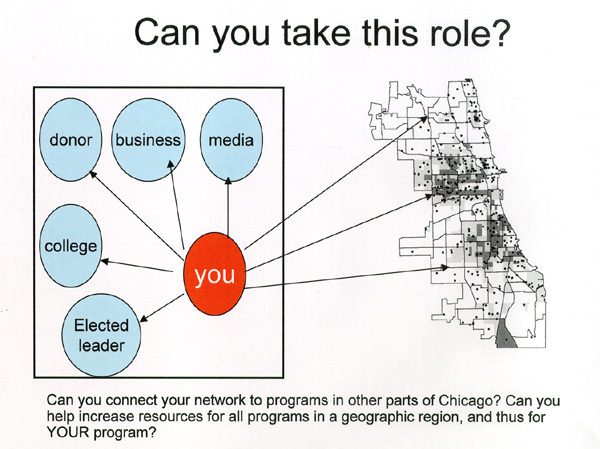 Adopt a program and become their journalist for as long as you can and then recruit someone to take your place. Learn to close your stores with a call to action: "Be a volunteer. Be a donor. Be an intern. Be a business partner." Then go one step further, point to a directory of tutor/mentor programs for your city, and say "we need great programs in every high poverty neighborhood." Point to videos, web sites, an social media places that expand the range of places and ways volunteers and donors can help tutor/mentor programs grow in an entire community, and in every state in the Union. This video does that. It was created a couple years ago by one of our interns. The contact information at the end has changed. We're no longer part of Cabrini Connections. However the message and purpose of the video has not changed. I'm no longer leader of a single tutor/mentor program because I could not find enough dollars to keep the Tutor/Mentor Connection operating under the umbrella and funding base of one small program. However, I'm no less committed to helping strategies grow in business, faith groups, philanthropy, media and government sectors that provides "a better operating system" and does more to make constantly improving mentor and/or tutor programs available in more places to help more kids through school and into adult responsibilities. If you've been touched by these stories or have responded to the President's Corporate Mentoring Challenge, I'd like to become a resource to help you develop strategies that benefit youth, your employees, your company and the community. 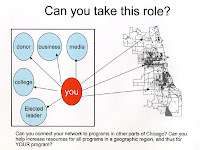 This graphic shows a small part of the network of people who have helped inner city Chicago kids move through school and into jobs and careers through the efforts of programs I've led at Montgomery Ward and Cabrini Connections since 1975. I think more programs who can build and sustain these connections should be available in big city neighborhoods. Through the Tutor/Mentor Connection and Tutor/Mentor Institute, LLC I've been trying to make that happen. Next week I'll be in Washington, DC attending the National Mentoring Summit. While I'm there I hope to connect with leaders from different cities and states. I also hope to connect with people who are not able to attend the Summit, but who will connect with me and others via Twitter and Facebook. While my goal is to find partners, benefactors and corporate leaders who will support our efforts in Chicago, I also am hoping to connect with leaders who view mentoring and tutoring as a strategy for expanding the social capital of youth living in highly segregated, poverty neighborhoods of big cities. I've written articles about social capital in the past and point to research that I'm reading that show how the income of your parents and wealth of your community determines your future and impacts your performance in school. If that's true, we should be looking for ways to demonstrate the growth of the network of adults and experiences surrounding youth who participate in these programs as opposed to youth who don't have access to well-organized tutor/mentor programs. I've been building my network of ideas, friends, peers for over 30 years. 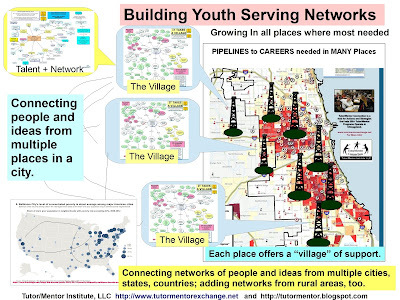 What if kids in inner city neighborhoods were able to build their own networks over a period of years and what role might tutor/mentor programs have in accelerating that process. 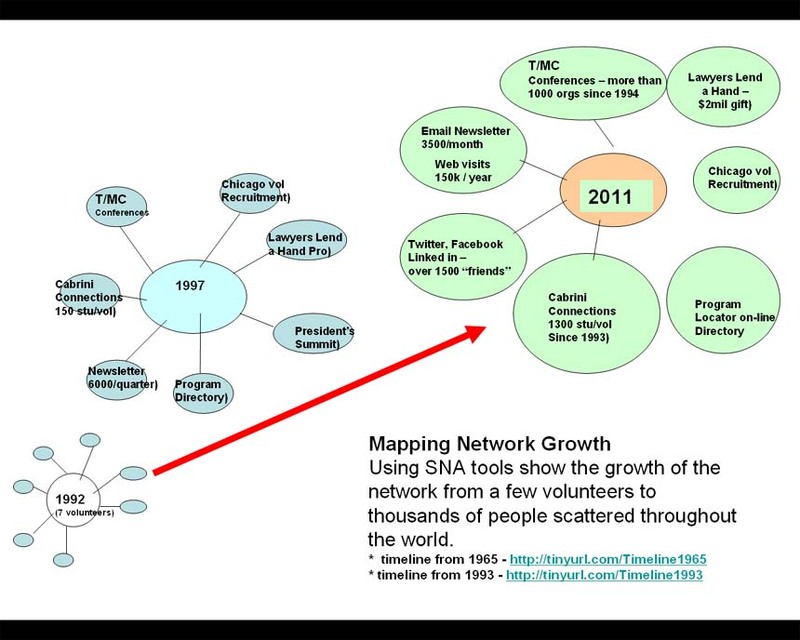 This graphic illustrates the growth of a network over time. This PDF shows this in a much more strategic way. Thus, my hope is that next week in Washington I'll connect with leaders who also are thinking of volunteer involvement in organized tutor/mentor programs as a strategy for building social capital for a youth, for the volunteer and for the programs that enable these connections to take place. The Dr. M.L.King, Jr. National Holiday is Monday, Jan. 16 and, like previous years, I’ve seen numerous articles encouraging people to go out and “volunteer” with suggestions including “prepare meals for a soup kitchen, visit the elderly and assemble food and toiletry kits for the homeless”. Here’s one story about the Holiday. Last Thursday I saw an announcement from the Serve Illinois Commission where Comcast is seeking community-based organizations to partner with for a company-wide annual day of service during the April National Volunteer Week. These service projects are great for team building and for short term, done-in-a-day projects. And they do necessary and helpful work. But do they really make a dent in poverty and complex social problems where more help is needed every day of the year, not just on national holidays? What if employee volunteers, family and friends were encouraged to do a “day of learning” where they visited web platforms with information related to poverty, education issues, challenges non profits face, etc. and where they begin to look at ways they and people they work with could offer time, talent and dollars throughout the year to support a full range of organizations working in different neighborhoods, but on the same problem? What might they study? 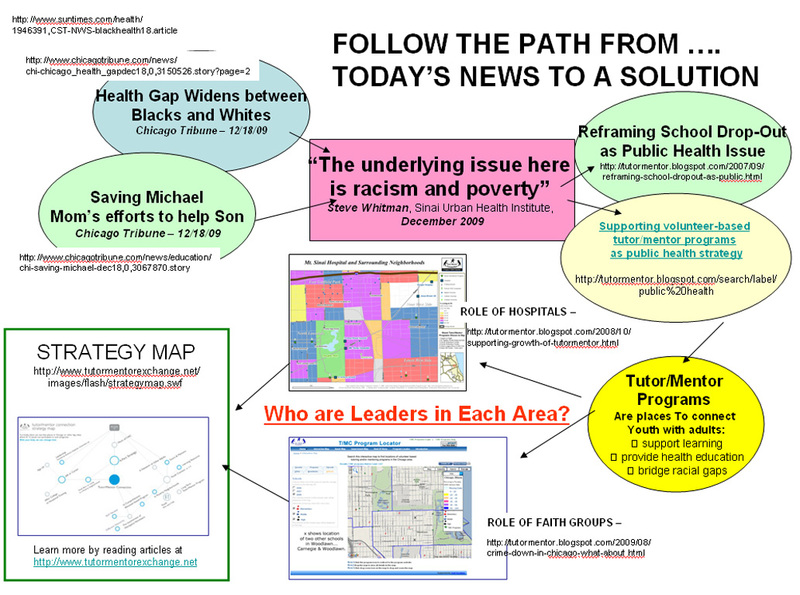 Below is a map I created a couple of years ago to show how groups could learn about the connections between poverty, education and health from a variety of sources. Such learning could lead more people to understand the value of volunteer-based tutor/mentor programs and the need for such programs to be located near youth living in high poverty areas. Thus, while many people could be painting classrooms, working in food pantries, or building housing on Monday, many others could be meeting at churches, business locations, hospitals, homes and in on-line learning communities, where they draw from an on-line library of articles and ideas. 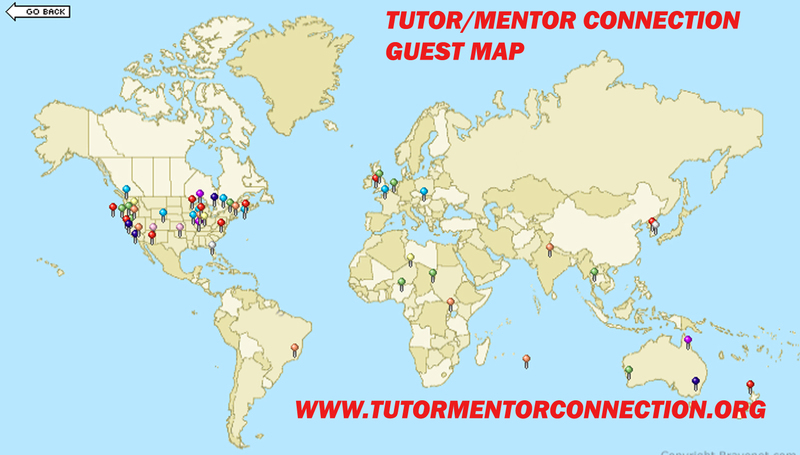 This map is from the GUEST MAP on the Tutor/Mentor Connection web site. If you visit the map you can click on the icons and see comments and introductions from people who have visited the site in the past. 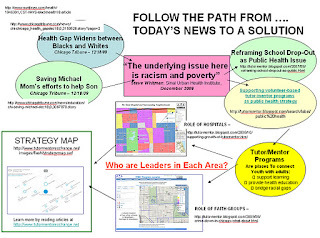 The map illustrates our goal of serving as a "social problem solving platform" that can be used by people from throughout Chicago, and the rest of the world. The potential for groups to connect in on-line learning groups is growing. I’ve written about organized on-line learning communities in the past. Here’s the link. Here’s a web site hosting on-line learning. 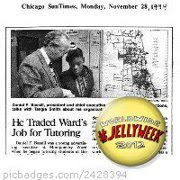 Furthermore, I've created an on-line directory that uses maps to help visitors understand where high poverty neighborhoods are in the Chicago region and where volunteer-based tutoring and/or mentoring programs are located, or needed. The learning that people do tomorrow and throughout the year can help more people understand the lack of mentoring, tutoring, learning, jobs, etc. that contribute to hopelessness and the gang culture that breeds violence and poor education outcomes in many of these neighborhoods. By visiting web sites of dozens of youth programs in Chicago and all over the world, volunteers, donors, business partners and program leaders can share the responsibility of building and sustaining world-class tutor/mentor programs in EVERY poverty area by borrowing from the best ideas from any of these programs and by providing the talent, dollars, technology needed on an on-going basis to implement these ideas. At the end of a day of reflection individuals and groups can post blogs, update wikis, and share their ideas in forums like http://tutormentorconnection.ning.com or in Facebook. If you've a favorite place for sharing ideas and collaborating with others, please tell us about it. I'm going to be taking part in a week long learning and networking effort, starting tomorrow. It's called JELLY WEEK. If you click on the JELLY WEEK map you can see that teams from nearly 200 places and more than 30 countries are participating. I'm part of a about a group collecting information about education efforts throughout the world. Members come from South America, Austria, Sweden and many other countries. If this type of collective learning is happening throughout the year, and during every national holiday, those who do service and those who do learning will be building better understanding of the complex problems we face and a more sophisticated range of solutions. As a result, more people will become directly involved in places throughout Chicago working to help solve social problems, and will be connected to people and ideas of other people throughout the world who are doing similar work. To me, the “I Have A Dream” speech means that some day in the future the problems of poverty, social inequality, wealth gaps, hunger, etc. will be less than it is today because of what we learn, and what actions we take based on what we learn. That won’t happen unless short term service projects are matched by learning, reflection and information sharing. For more than six years I've pointed to the Boston Innovation Hub as an example of a community portal that has the potential to connect all sectors of the community in problem solving that addresses each slice of the community interest pie. This is one article where I've done that. I've been connecting with a network of innovators from around the world who are planning an international collaboration for next week. They call this JELLY WEEK. More than 30 countries and 170 teams are now involved. This idea started in spring 2011 in Germany and has grown over the past six months. I'd love to have people building a Social Network Analysis map that shows this growth. 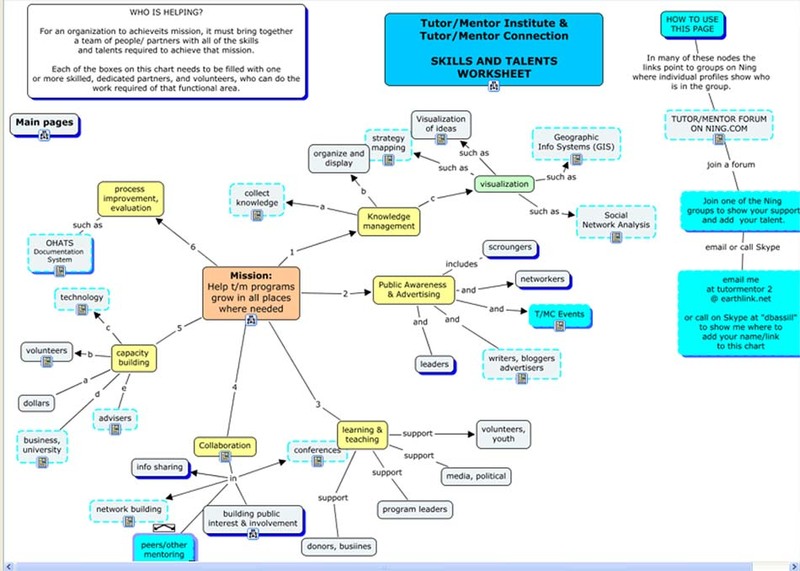 I've set up a group to map the growth of the Tutor/Mentor Connection network which you can see here. 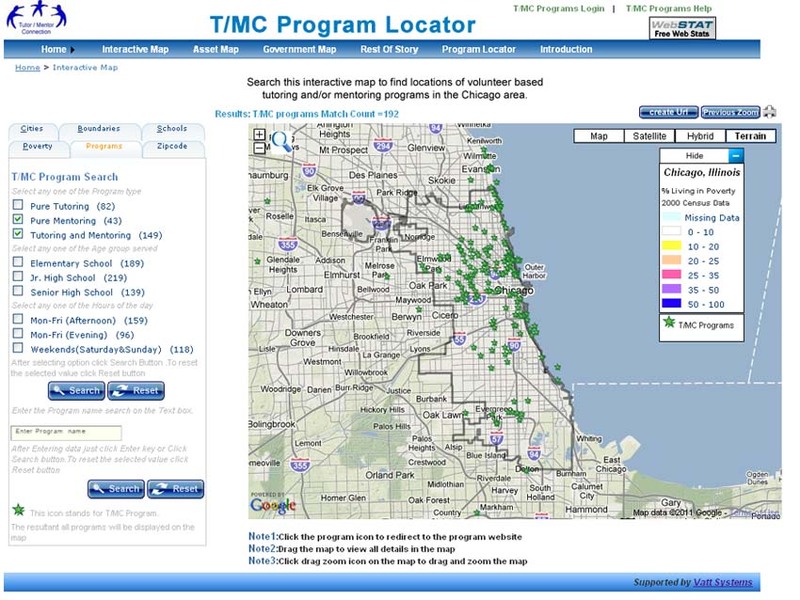 There are still features that could be added to these hubs that would build a citywide understanding of organizations working to solve specific problems, which is what we do with the Tutor/Mentor Program Locator. If we can build this information into hubs like the "Understanding Glasgow" hub, then the collective efforts of many people in the region could generate greater visibility for the entire sector of organizations working to solve a community-wide problem, and this can lead to more consistent flows of operating resources and talent to each neighborhood where the problem is high, and to the organizations already operating in these neighborhoods. During the JELLY WEEK I'll be on-line with a group from Sweden and I'm working with another group from South America and Europe. 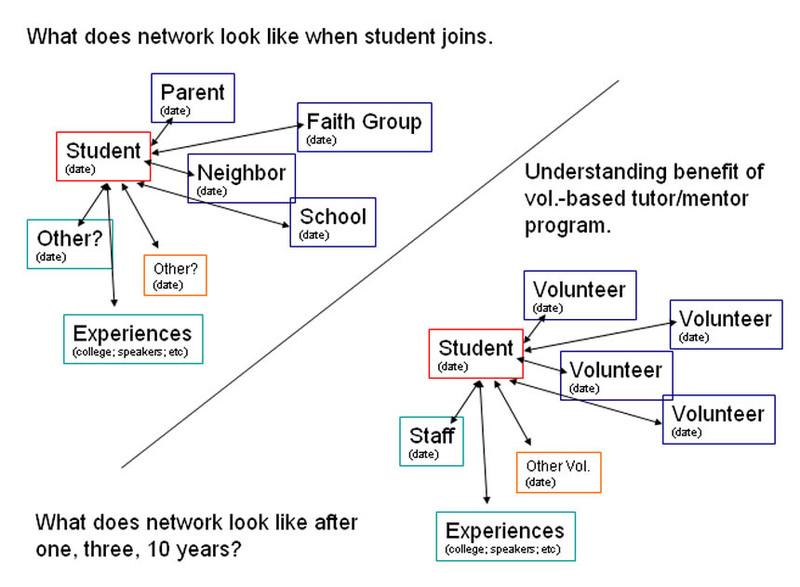 If you'd like to help build our our maps and network analysis tools, join me in the Tutor/Mentor Connection forum. The chart below shows the range of different talents I'm trying to recruit to help achieve the goals of the Tutor/Mentor Institute, LLC and Tutor/Mentor Connection. See the actual chart here. I read an article today about Yoxi: a new Media Platform for Social Innovation. The founder, Sharon Chang, was interviewed in this article and when she talked about recruiting talent she said, "the kind of creativity we need to achieve sustainable success comes from stretching the mind to a state of real elasticity. The first step is to believe in making the impossible possible". There are plenty of people in the world to tell you that what you're doing won't work. However, finding talented people who will try to make the "impossible possible" is what I've been trying to do for many years. A collective effort requires involvement from many people to communicate ideas and expand the number of people and resources involved in community problem solving. At this Debategraph site you can see how an article I wrote was shared by David Price, co-founder of Debategraph. Communicating complex ideas in a conversational way is an everyday challenge. Visionary ideas are large and abstract, requiring distillation into language that resonates. Dan Bassill's message is visionary and distinct. While he endorses the traditional funding sources of government and philanthropic grants as necessary for the operation of nonprofit youth mentoring organizations, he insists it’s not nearly adequate. He promotes a more sophisticated paradigm for this work. 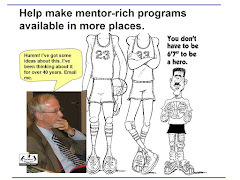 He encourages comprehensive, long-term corporate sponsorship cooperation, extending well beyond cash contributions, for neighborhood tutor/mentor programs until it becomes a commonplace, everyday business practice -- a customary and expected corporate "give-back" that is very generous in its scope. The redounding benefits are myriad. Let's set aside one-on-one tutoring in a volunteer role. We’re talking about something much more substantial. Let's say a corporation makes a commitment of $1 million over five years -- not cash, but in-kind, in the form of donated staff time and expertise. That's $200,000 a year of in-kind donations. And it takes this form: The CEO commits a webmaster, a marketing person, a graphic designer, an advertising/publicity person, a social media person, and a tech person who can service the organization's computer equipment. These are all people who already work for his/her company. This collaborative work is possible to conduct largely if not all online. Makes it very easy. And the corporation will do all the printing of miscellaneous collateral materials, and it'll include a postage stipend of some kind. And it'll throw in $75,000 in cash earmarked strictly for a first-rate fund-raiser for each of the five years, with a modest salary increase each year. Now as a result of this, the tutor/mentor organization, in effect, has just boosted its staff size dramatically, knows it can count on all of this support for the next five years, and it frees up the executive director and the programming staff to do what they know how to do best, namely, help the kids: focus on service delivery, without having the worry about all the stuff the corporate sponsor is going to provide. This remarkably significant support would make it possible for the program to expand and improve in ways that are nearly unimaginable and should prove to be hugely successful. Because for five years, that organization won’t have to scrape by, won’t have the very burdensome distraction of going out day after day, hour after hour, fighting for every possible donated dollar. It frees up the organization's staff to serve the kids; and working with the professional corporate staff assigned to the organization allows the organization's staff to learn so much more about how to do those various tasks much more effectively. Meanwhile, as we all know, since the kids are being successfully mentored, it makes it much more likely they'll stay in school and proceed on to college, and become productive, skilled members of the local workforce. There is one extremely important point to keep in mind as we encourage CEOs to pursue a major corporate commitment to this (or any) volunteer endeavor. Today's workplace environment is now focused on uber-productivity, which is another way of saying that many employees are being expected to do the work of two or three people, and working very long, arduous hours as a result. When that CEO pitches his/her staff to become volunteers for what is likely to be perceived at first as the CEOs "new pet project," there must be an element of fairness in the equation. That is, the responsibilities the CEO is asking his/her volunteer team to assume should be treated as every bit as important as company business -- not something to be viewed as low-priority; not low-level work relegated to being done at midnight at home because that's the only time the beleaguered employee can carve out. The type of corporate sponsorship discussed herein will fail if executed thoughtlessly. Avenues exist already that can permit this corporate sponsorship model to multiply exponentially, both domestically and internationally. It deserves much greater attention from elected officials, donors and urban business leaders everywhere. 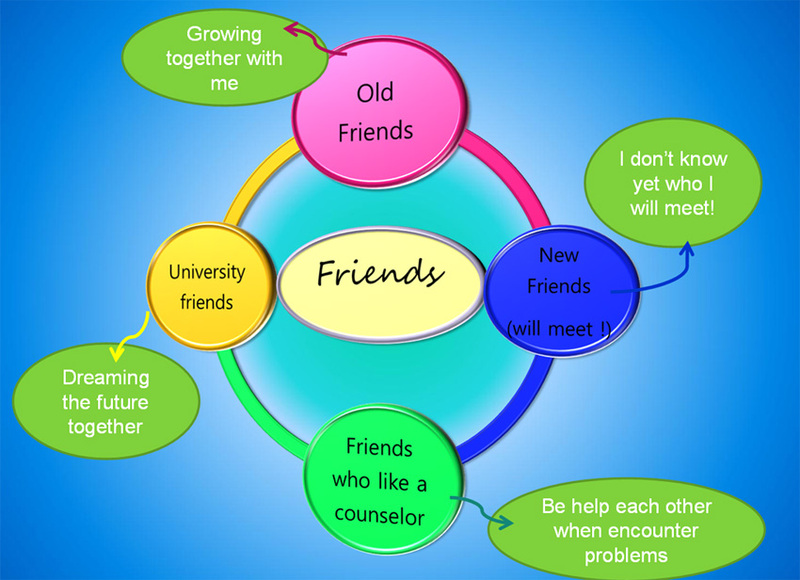 At the Tutor/Mentor Connection forum blog you can find writing by others who are helping interpret Tutor/Mentor Institute, LLC ideas. This article shows work that other volunteers and interns have done. If you'd like to help interpret our ideas or invite me to speak at your company, civic group or conference, join the Tutor/Mentor Forum or introduce yourself to me on Twitter or Facebook. This map shows the platform I've been trying to build for more than a decade. It shows many areas where others can share ownership and responsibility for building this platform and for encouraging others to use it. I think it can apply in any city/urban area and thus partners/talent to build it can come from any part of the world. Now I need to find investors or partners to help build this platform to meet its potential and the do more to connect people who can help and people, youth and programs in places where help is needed.